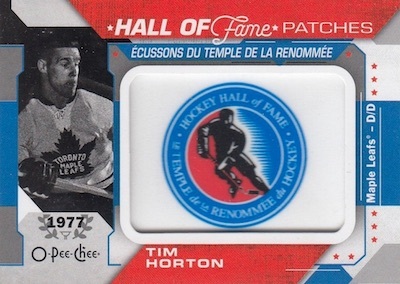 A popular early-season NHL release evoking the look of a prior hobby era, 2018-19 O-Pee-Chee Hockey goes deep with a massive base set, many parallels and several limited inserts. As is tradition, the Hobby boxes don't guarantee any hits, but collectors can still find quite a bit packed into each Upper Deck box, including the "Easter Eggs." 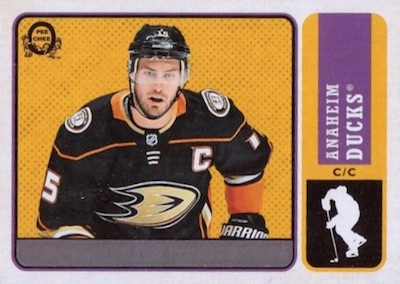 Centered around a 600-card set, the 2018-19 O-Pee-Chee Hockey checklist has 500 base cards and another 100 High-Series SP subsets. The short-print lineup includes Marquee Rookies, Season Highlights, League Leaders and Team Checklists. There are also Retro (1 per pack) versions of the base options. These high-series cards and retro variations combine to fall two per pack. 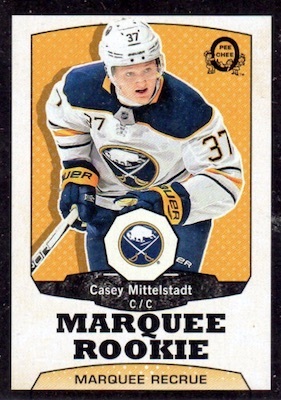 Collectors can find holdover rookie players, such as Adam Gaudette, Casey Mittelstadt, Eeli Tolvanen and Ryan Donato, in the Marquee Rookie subset. Base parallels consist of Silver Border (1:3 packs), Gold Glossy (1:24 packs) and Retro Black Border (#/100). The numbered Retro Black Border editions are issued in Super Boxes that replace all base cards with the limited parallel. In addition, the 77-card Minis set shrinks down top players at an overall rate of 1:4 packs. Base versions fall 1:6 packs, short prints average 1:26 packs, and the rare variations are pulled at a rate of 1:64 packs. Numbered to just 27 copies, the entire set offers Back parallels, as well. 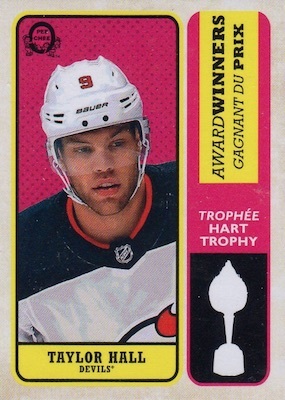 Of course, 2018-19 O-Pee-Chee Hockey provides additional inserts to track down. The distinct OPC Playing Cards set includes the full lineup from a standard deck. 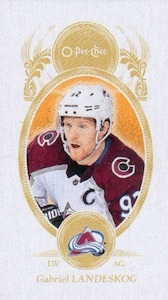 Card #2 to the King averages 1:5 packs while the short-printed Ace is quite rare at 1:120 packs. 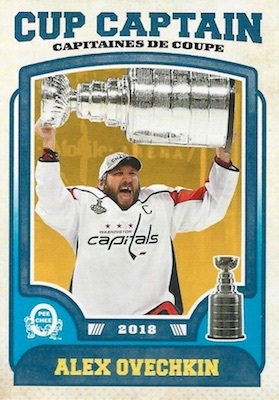 A fan-favorite chase, 2018-19 O-Pee-Chee Hockey also continues the manufactured patch cards with 100 new choices. Themed sets include HOF Logo, Logo Updates and Trophy Winner patches at some pretty steep odds. 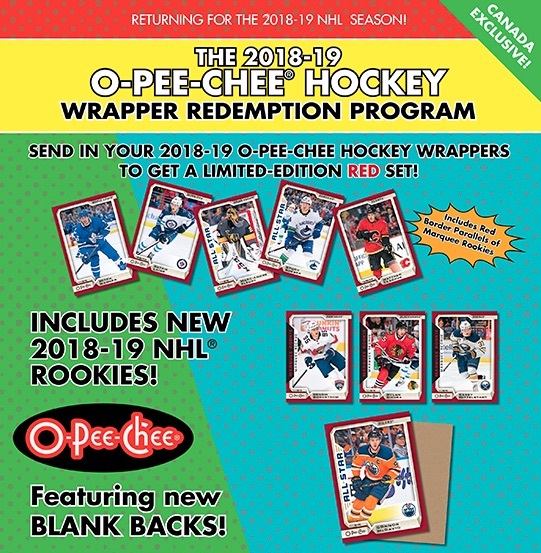 Finally, make sure you save your wrappers as the 2018-19 O-Pee-Chee Hockey wrapper redemption returns for Canadian collectors. For every 50 Hobby wrappers submitted to your local Certified Diamond Dealer, you earn one free pack. Each pack includes five Red Border base parallels and one Red Border Blank Back. 600 cards, including 100 high-number short prints. Shop complete base sets on eBay. Overall SP Odds (#501-600) - 1:1.5 Hobby/Retail/Blaster; 2:1 Fat Pack. WRAPPER REDEMPTION PARALLELS: Red (5 per pack), Blank Back (1 per pack). Overall odds - 1:0.75 Hobby; 1:3 Retail/Blaster; 2:1 Fat Pack. PARALLEL CARDS: Black #/100 (Hobby), No Name/Scratch-Off SSP (Unannounced). 77 cards, including 27 short prints (SP/SSP). Overall base odds - 1:5.1 Hobby/Retail; 1:10.2 Blaster; 1:6.8 Fat Pack. SP odds - 1:25.6 Hobby/Retail; 1:51.2 Blaster; 1:34.1 Fat Pack. SSP odds - 1:64 Hobby/Retail; 1:128 Blaster; 1:85.3 Fat Pack. PARALLEL CARDS: Black (Base - 1:8 Blaster; SP - 1:38 Blasters; SSP - 1:96 Blasters), Back Variation #/27 (Hobby). Base - 1:5.1 H/R; 1:10.2 B; 1:6.8 F.
Mini SP - 1:25.6 H/R; 1:51.2 B; 1:34.1 F.
Mini Rare SSP - 1:64 H/R; 1:128 B; 1:85.3 F.
Unannounced. Let us know if you spot any others. Buy on eBay. 52 cards, including 4 SP Aces. Overall odds - 1:4 Hobby. Aces odds - 1:120 Hobby. Aces SP - 1:120 Hobby. Overall Patch odds - 1:96 Hobby. 10 cards, including 2 short prints. HOF SP odds - 1:18,750. Logo Update odds - 1:1,125. See the 2018-19 O-Pee-Chee Hockey checklist spreadsheet. Here are the top deals on retail boxes currently listed on eBay. Any retired players/Legends included in this set?! If O-Pee-Chee represents some Legends I’d be very impressed. Those Patch Card odds are just outrageously ridiculous! Love O-Pee-Chee Hockey but man those pack odds just bloe me away. I mean these numbers should be lowered by quite a bit if you ask me. Thanks. 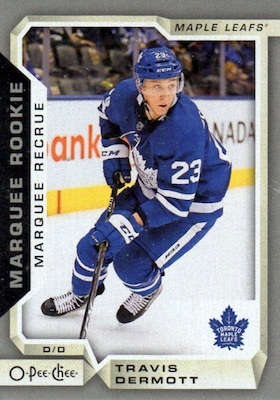 O-Pee-Chee has some really nice looking standard rookie cards with the bonus of retro looking variation cards. Rookie release wise not there aren’t many cant miss prospects in here but those are usually in the update anyways. Hopefully they keep the update set cards standard numbered and not make it a insert subset like they did a few years ago. Darn near 4000 different cards in this set, now add in the multiples, crazy production run. $25 a box is much fairer price for this product. because it’s exactly the same year after year. Less than 10% of OPC followers are able to finish the base set. The 10% that succeed have to spend too much time and money, so for the first time ever am giving up. If you want to have fun and no head aches just try MVP. I purchased a case like I usually do to start the hockey season. I like the overall look and I like the retro card design. Beware that the Black Border, Silver Boarder and Gold Glossy are cardboard like the rest of the base set. Not sure what to think of that yet. The Hall of Fame Patch cards are really nice. I pulled a Marquee Legends ML-10 Maurice Richard Montreal Canadiens. Love the cards this year, although the playing cards are Hobby Only Trey! Yup. That’s why the overall odds say 1:4 Hobby. Blank backs are bank. Pulled 5 from a sealed case. On the minis, I didn’t pull a single black parallel in the entire case though I did get 2 of the back variations #/27. Pretty nice mid-entry set. Opened two cases, I pulled one Marquee Leaders per case, one scratch off per case (I did scratch one and it was just the name), one award winner, three Aces per case, the mini back variations came two in one case and four in the other, the blank backs came five in one case and four in the other. Not a huge sample size but hopefully it can help to estimate unannounced insert odds. 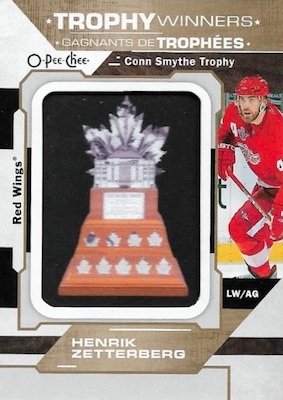 Another junk product from upper deck that is way over-priced for nothing but manufactured patch cards. 75.00 dollars plus tax!!! Really… wait until black friday and they will be 30.00 dollars. I used to like upper deck, was my favorite card company. Not anymore. Their customer service is just horrible to deal with. Beware the woman manager that takes your call. Taking autos out thier products and giving you less is upper decks new policy. Stay away. Always like the OPC. For those buying hobby the mini black borders are retail blasters only. Not in hobby packs. 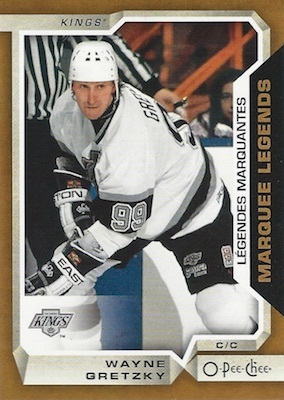 As much as I love O Pee Chee I hate the way Upper Deck handles it. I love the design for this year but I hate the bloated 600 card set. 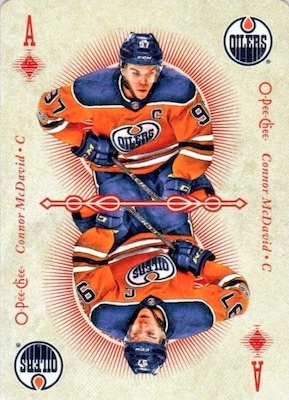 Parallels are nice but they aren’t even foil anymore. Just plain silver and black. Odds of patches are pretty high and the set no longer has signatures. For such a low end collection it’s hard to tell by the price one pays for a hobby box. Really wish they’d put more value into this brand. It’s got such a great history. Such a shame. Will not buy again next year. Bought a blaster box at Target today. All but 5 cards had white spray from printing across the front tops. Sad. Another waste of $20. Upper Deck Quality Assurance is AWFUL! ALREADY BOUGHT THREE HOBBY BOXES. Curious if all retro cards have a scratch off parallell or if it’s just some? Some players Ive seen multiple of, but some none at all.. Anybody knows? The cards are OK,but the numbers are difficult to read especially the 5,6,8 and the 9s because of the fonts.